2 Bedroom Terraced House For Sale in Alton for Guide Price £375,000. A charming Grade II Listed end-of-terrace cottage standing just off Gracious Street with lovely views towards The Hangers. 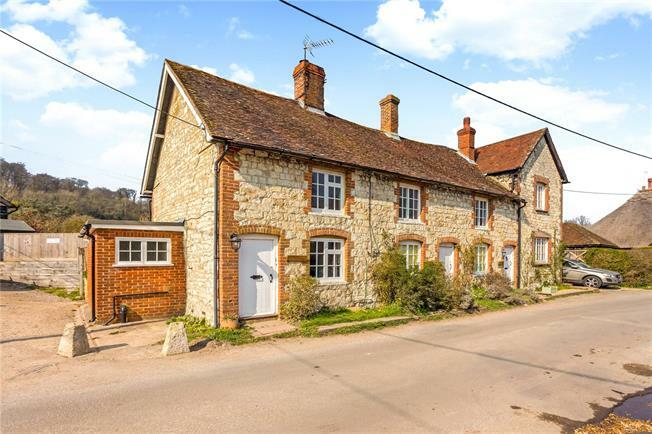 The cottage takes full advantage of the features associated with a building of this period with beautiful elevations of local stone and brick beneath a tiled roof. The characterful accommodation includes a sitting room with a clear view wood burning stove together with a recently re-fitted kitchen/breakfast room and a small separate utility area to the ground floor. The kitchen is fitted with a range of shelved cupboards and drawers and includes an electric oven and hob as well as space for a refrigerator. There are two bedrooms to the first floor and recently a re-fitted and stylish shower room to the ground floor. The shower room has a large shower cubicle, basin, WC and storage cabinets. Of note, the recent careful refurbishment of the cottage included the installation of timber framed windows. This is a rare opportunity to purchase a delightful period cottage with an attractive enclosed garden, fine views and off road parking. The cottage occupies a very fine location just off Gracious Street about a quarter of a mile from the centre of the village. Gracious Street is a small rural lane leading out to open country and the village of Newton Valence. Selborne is renowned for its association with Gilbert White, the 18th Century naturalist and is surrounded by scenery of outstanding natural beauty lying at the foot of a beech covered hanger in-between the villages of Hawkley and Farringdon within the South Downs National Park. The village has a very strong community with a public house, shop, church and primary school. The market towns of Alton and Petersfield collectively provide a range of facilities and schooling as well as mainline railway stations to London Waterloo. In addition, the A3 can be accessed at Liss providing a route to London and the south coast. The surrounding countryside provides ample opportunity for many country pursuits. The enclosed rear garden is primarily to the rear of the cottage and has been landscaped to take full advantage of the setting with fine views to the Selborne Hangers. There is a paved terrace providing an ideal outside seating area together with an area of lawn. Timber shed. A gate provides access to the side and the parking area.